It is hard to be 14 and you're not sure where you fit. You want to be a part of the popular crowd. You want to be noticed, but yet you don't....it is an awkward age. Your friends are finding their place or at least that's what they want you to think. You are self-conscious of the way you look, the way you walk, and ....just about everything! With all of that on your mind, you have homework! One day after a long day of school with books in tow and the pressures of a 14 year old weighing on my mind, I returned home to find a new dress displayed across my bed. It was red with an inset of navy blue...a very patriotic fashion. I was so excited that the troubles of the day were erased from my mind. I couldn't wait to put it on, but Mother said that I couldn't until I had red shoes to wear with this new dress. It would be Saturday before we went shopping so the excitement held on for a few more days. There is something to say for anticipation! Saturday came and we were off to the shoe store. (I had been so afraid that Mother would forget, but I think it was important for her, too!) We found the perfect pair of red sling-back heels (only slight, but heels just the same!) Now I would be properly dressed. Doubt creeps in......how would I look, how would I walk, how would I.....just about everything? Only a week ago, I sat glued to my TV as I watched another fellow countryman take the oath of the office of President. No matter whether I agree or disagree, whether I have doubts or concerns, I watch as history is made each and every time there is a change of command. I wanted to put on my red and blue dress with my red shoes, put my hand over my heart, and pledge my allegiance to my country. NO!.....I don't still have that dress or those shoes.....who keeps things in their closet that don't fit? I am thankful to live in this country of the free and I will pray for my President just as I always have. I will pray that God will give him wisdom as he makes decisions, that God will protect him from any kind of evil, and that God will give him good health and strength to lead our land. Why wouldn't I want the best for our President? Why wouldn't I.....I will be directly affected. Won't you join me? Let's put on our red shoes and pray! Have you ever felt tired, old, and worn out? I think that even when you are young, you sometimes feel that way. My youngest son told me the other day that he just couldn't believe that he would be 23 years old this year.....and that is hard for me to believe, too. There are some joys that come with age.....a little wisdom from experience and a 10% senior citizen discount. It occurred to me this past week as I was driving through the nearest Taco Bueno (didn't feel like cooking, but I did have a salad...Nacho Chicken Salad is the best) that this is my year. On the window of the drive through was a sticker that declared that a 10% discount was available to those 55 or older. I know, I know....10% is not much but in these times, won't we all take any kind of discount we can get. Have you ever had a pair of shoes that were showing their age? They don't look like they did the first time you pulled them out of the box. Maybe the tongue is a little crooked, the sole is wearing thin, the toe is scuffed, or the laces are frayed, yet.......they remain in the closet. (I sometimes feel and look that way, especially the thin part...How about you?) You probably wouldn't wear them in public, but they are, oh, so comfortable. After all, your toes made an impression, the heel has conformed to your foot, and the color was perfect for that special outfit. Where is that outfit? Our Sunday Dinner this week is like those shoes...a pair of worn out, definitely old, but no one around here is tired of them...recipes. Besides, these dinners could give you a 10% discount (both use ground beef, at least a cheaper cut than prime rib), but you don't have to be 55 or older. No carrot and raisin salad here! Brown ground beef and onion in skillet. Salt and pepper the mixture. Combine remaining ingredients in a large bowl. Pour half of the cornbread mixture in 9X13 greased baking dish. Place meat mixture over first layer of cornbread mixture. Layer cheese on top of the meat. Pour remaining cornbread mixture over cheese. Bake at 400 for 40 minutes. Mix 1/4 cup soup and all other ingredients, except water. Mix thoroughly and shape into patties. Place in 9X13 baking dish. Bake at 350 for 30-40 minutes. Remove from the oven and spoon off fat. Mix remaining soup and water and pour over meat. Bake another 10 minutes. Along with Sunday Dinner this week, I want to share an easy, delicious, calorie-free dessert. Give me points for trying! Preheat oven to 350. Peel and cut apples into eighths. Microwave apples on high for 3minutes. Take each apple slice and roll in a crescent roll. Place rolls in a 9X13 buttered baking dish. In a bowl, melt butter, adding sugar and vanilla, mix well. Spoon butter mixture over each roll. Sprinkle with cinnamon. Pour Mountain Dew soda over the entire dish. Bake uncovered 30 minutes or until lightly browned. Try a Sunday Dinner and enjoy the discount. Like the tired, old, and worn out shoes.......comfortable shoes food! A strong audio memory for me is the soft, gentle purr of a sewing machine. My mother sat at her sewing machine for many hours a day. If she was not constructing a fully lined suit with bound buttonholes for an executive secretary in our town or the principal of the nearby school, she was making a simple dress for one of her two beloved daughters. I was the recipient of so much of her handiwork. I remember standing in the chair behind her as the needle bobbed up and down with the motor purring along. That sound is still so sweet and I remember many of those special dresses that Mother made for me. I soon wanted to learn the craft and make my first dress. It was the color of maize with shades of brown pencil-like drawings of sailboats. Sleeveless, little chic number that made me so proud.....I was only 10 years old. "Pride cometh before the fall" or so the saying goes. Well, it goes all right! It was summer and in Texas that means heat, sleeveless dresses, and Vacation Bible School. Yes, my dress was the perfect choice for a hot, Texas day and Vacation Bible School, after all it was sleeveless. I was so proud! I had made my own dress and nothing else would do that day. I know that I was envied by all of my friends. Who else could say that they were wearing a beautiful, maize, sailboat-bearing dress made with their own two hands and a gentle, purring sewing machine? How many other mothers would have trusted their 10 year old daughter in the driver's seat of a powerful, needle bobbing machine? I loved color, fabric, thread, buttons, gadgets, and yes, the soft, gentle purr! Did I say I was proud? No, I didn't fall down the aisle....my side seam split. Not just a little but about 5 inches close to my waist....a gaping hole! I couldn't stop...I had to keep walking.....all the way down the aisle...one foot in front of the other. Now all eyes were on me and my sideseam was open. I couldn't put my arm down to cover it...I was holding the BIBLE for goodness sakes! Tears welled up in my eyes. I was sure that everyone knew that the tears were from spiritual emotion. They couldn't see that my underwear was showing through the opening. I stood paralyzed through the Pledge to the American flag, then a song....Pledge to the Christian flag, then a song....Pledge to the Bible, then a song. How much longer was this going to last? My knees were weak. I couldn't say the pledges, I couldn't sing. I just stood there with tears beginning to run down my cheeks. (My heart is beginning to pound just thinking about it.) There was no one coming to save me, so I must be right....no one knew. (small sniffle) I was so glad when the flags were put in their stands and I could put the Bible on the altar table. It was time to find my place with my age group. Walk up the aisle....all the way up the aisle near the back of the church. It was at that moment that I became aware that everyone knew. (Chuckles!) I had to sidestep (more chuckles!) the entire length of the pew (and more Chuckles!) with my torn sideseam at the eye level (even more chuckles) of all my seated friends. I had no one to blame but myself....afterall, I was the proud seamstress. That didn't stop me though. I still love to sew! I take pride in my work, but no longer am I proud. There is a difference! How can someone that is barefoot be proud? That's right....I sew barefooted. No shoes for me....at least not under the sewing machine, not until lately. I am no longer that 10 year old and I feel strains and stresses on my body sometimes when I sew, but I have found a solution. Flipflops....the ones with a little rise in the heel. Yes, the ones that let your feet breathe, wiggle, and show off that pedicure are comfortable. Is pride sneaking its way back in? I'm still barefoot (with a flipflop underfoot)........The Barefoot Contessa Seamstress. As 2008 came so quickly and is now a thing of the past, I take time to reflect. I stopped making resolutions a long time ago......never stuck to them. Reflection rather than resolution sounded like a better alternative. Yes, the shoes in my closet have changed. I have worn some new ones this year. Not all of them were comfortable, but what changes the way we look often is not comfortable. Those high heels and pointed toes never promised to do anything for your feet except make you look slimmer....yeah, right! There is only one thing that makes you look slimmer and that is to become slimmer. I gave up on that a long time ago too. The shoes that I would rather wear are those ever so comfortable flipflops, that is, after you form a callous between the toes. They give your feet room to breathe, wiggle, and show off that pedicure. Well, back to reflection....2008 was the year that I my age became the year of my birth. Let me explain....if you were born in 1980, then when you are 80, your age is the same as the year of your birth. Try to figure yours out. It might be confusing, but I don't know, it was kind of interesting for me and seemed to mark a place in my life just as 2008 did. Oh, those traveling shoes! I used my passport for the first time in 2008. I had been out of the country...Mexico....not hard to do when you live just hours from the border, but in all of my years I had never really left the good ole US of A. This was monumental for me! My passport finally has the stamp of Canada. In May, I joined my husband, who was there for business, for a long weekend. I have always lived where there is as much daylight as there is darkness or so it seems. As I arrived in Canada, it was late in the evening, but the sun was still up. My body had some adjustments to make and I never realized that I actually felt hungry according to the sun rather than to time or my stomach. We spent the entire weekend driving through the Canadian Rockies. It was breath taking to say the least. I saw animals that I had never seen before at least not without bars between us. There was a thrill around every corner or should I say curve. Definitely wore some comfortable shoes on that trip. Not much to look at, but tennis shoes were what I needed for traipsing through the Canadian Rockies. That was not the last time fast traveling shoes were needed in 2008. In July, we made a trip to Seattle to help some friends that are planting a church in the area. We assisted with a sports camp that they hold every summer to get accainted with the community. We met so many wonderful people and certainly enjoyed the opportunity to serve our God. Before we left Seattle to return home, we made a trip to the top, well, it felt like the top, of Mt. Ranier. Gorgeous shoes! There were times on the drive up, that I was ready to turn around. SCARY shoes! The passenger seat is right next to the edge of the road and the edge of the road is right next to the edge of the mountain. The drive up was not so pleasant, but well worth it! In the middle of July, there was snow! I am not used to seeing snow even in the winter much less the middle of July when the average temp for my neck of the woods is 100. So much for the comfortable shoes. I didn't get to wear them all year. There were some uncomfortable shoes to be worn. The shoes of grief. 2008 was the year that I would say I love you for the last time to my dad. Daddy was 89 in March of 2008 and had lived a long, wonderful life. He had been living in a nursing facility just shy of 4 years. I feel so blessed to have had those 4 years. I saw Daddy at least 2 times every week. We shared some very happy visits. It gave me a chance to ask questions about his life and family. If he had not been ill, I might not have taken that opportunity or even thought about it until it was too late. The shoes of grief are hard to wear, but......I have found such great rejoicing in those shoes. I guess I could call them dancing shoes. I know that I know that I know that Daddy is facing Jesus today. He had looked forward to his homegoing for a long time. He was ready without a doubt. What made my Daddy happy was seeing me happy and now I can truly say that I am happy because I know Daddy is whole, happy, and rejoicing in Heaven. I will tell you another time more about these shoes, although not so comfortable, comfort can be found in them. 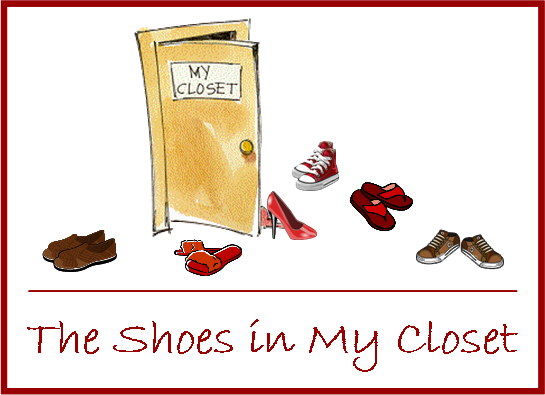 Oh, there are so many more shoes in my closet. The ones worn by a newborn baby's mom, a sports mom, a room mom, a brokenhearted mom, a mom of the brokenhearted, an ICU mom, a mother of the bride, a grand....mom otherwise known a Mimi, and the list goes on. I have worn them all and I want to tell you about those shoes...all of them as an encouragement to you that the shoes come off and there is rest!